If you’re anything like me, your printer is currently buried underneath a pile of junk, or maybe you don’t even own one! Over the years I found myself printing out patterns less and less frequently until I stopped doing it at all. 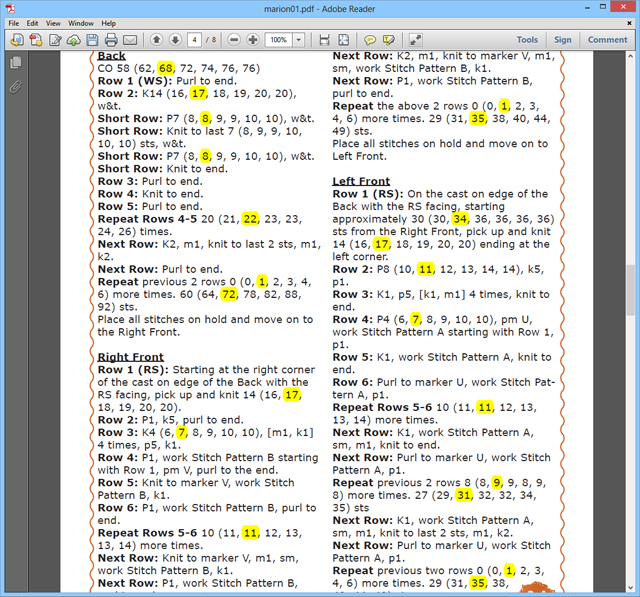 The only thing I missed was being able to write notes on my pattern, but one day at work at my previous job as an editor, I realized that I could use the same tools I used to make notes on formatted articles to annotate my PDF knitting patterns. All it takes is basic Adobe Reader, and you can do all of your normal notes digitally. 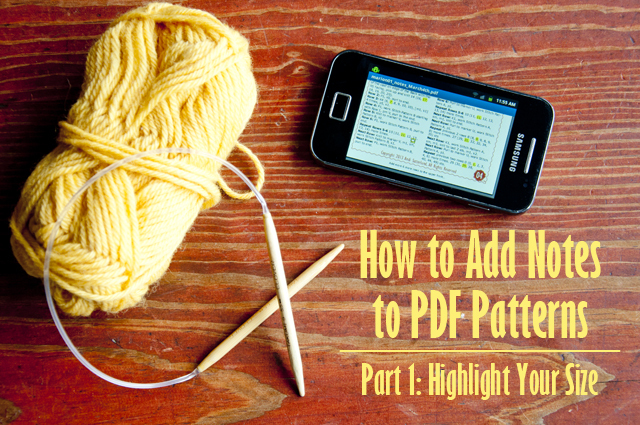 The first thing I like to do with a pattern is highlight my size throughout the instructions, and in part one of how to add notes to a PDF pattern, I’ll show how to do just that. 1. Select your size with your cursor. 3. Click away and voila! You can see that it’s now highlighted. 4. Work your way through the pattern and make sure you don’t miss any parts. 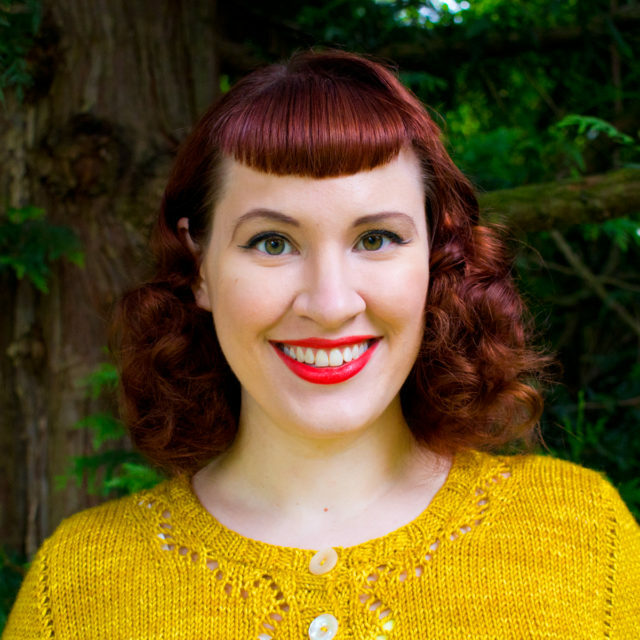 Highlighting your size is one of the most important steps in making notes on a pattern, but sometimes you want to write in modifications and reminders, too. 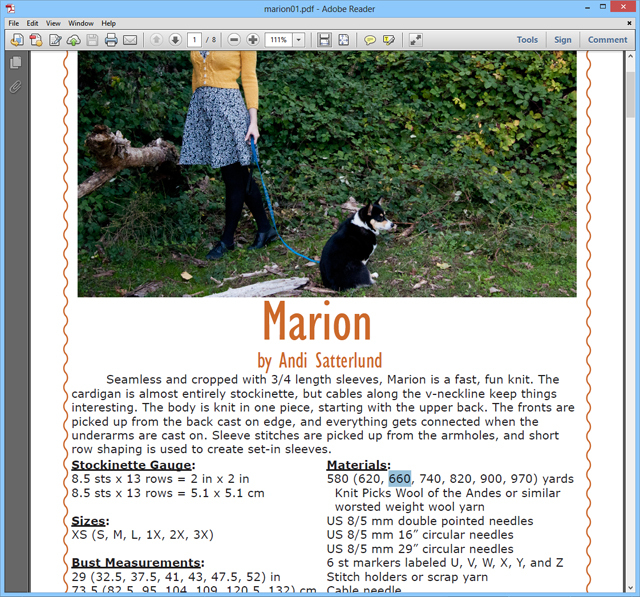 You can also do that on a PDF using Adobe Reader, and later this week I’ll show you how in part 2 of how to add notes to a PDF pattern. Brilliant! And hello! I haven’t visited in awhile, but I can’t wait to see what you’ve been doing lately! Thank you,Sure will help me with my PDF’s . What a helpful series of posts! After watching a colleague make notes on articles for class, I finally figured out a couple of ways to leave myself notes on PDF patterns, but this definitely isn’t one I had figured out. 🙂 I typically just cross my fingers and hope I remember where I’m at, haha. Thanks for the tip. I open PDFs on my iPad using Notability which let’s me draw all over them and highlight etc, just like a paper version. At the end you can just erase all your notes and start afresh if you choose. ah, so clever! I haven’t seen a tutorial like this before, thanks so much for sharing! Thank you, should save some paper. Whoops! The last point should have been #4. It’s fixed now. I have windows 8.1. I do not have a highlight feature in Adobe Reader. Am I missing it somewhere. I sure could use this feature. If you’re not seeing it when you select and right click text, you might need to update your Adobe Reader. It’s also possible that you have a locked pattern. Some designers lock their PDFs so you can’t add notes to them.